Above, crowd at the Elmvale Community Hall; list of Honduras political prisoners posted at the meeting; Springwater Mayor Bill French and Simcoe North MP Bruce Stanton; Janet Spring and her daughter Karen, a human rights worker in Honduras. How does a small rural community take on a repressive Central American dictatorship? With determination – as demonstrated by some 150 people who packed the Elmvale community hall on Sunday afternoon in response to an appeal by a local farm family to help secure the release of political prisoners in Honduras. 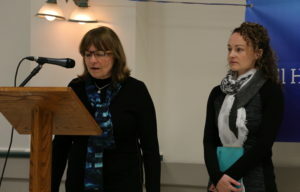 Pressure from Elmvale has made a huge difference, said Janet Spring, who has been working on behalf of Honduran human rights worker Edwin Espinal, being held along with 21 other political prisoners under “horrific” conditions in military style jails. Espinal is the husband of Janet’s daughter Karen, also a human rights worker based in Honduras. Karen choked back tears as she thanked people for coming out in support of her family. “It means a lot to see so many people from the community where I grew up,” she told the crowd. 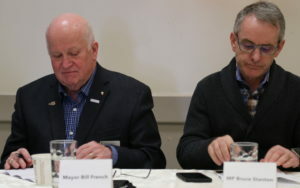 A full complement of local dignitaries joined the Springs at the head table, headed by local Conservative MPs Bruce Stanton (Simcoe North) and Alex Nuttall (Barrie–Springwater–Oro-Medonte), along with Springwater Mayor Bill French and Deputy Mayor Don Allen. 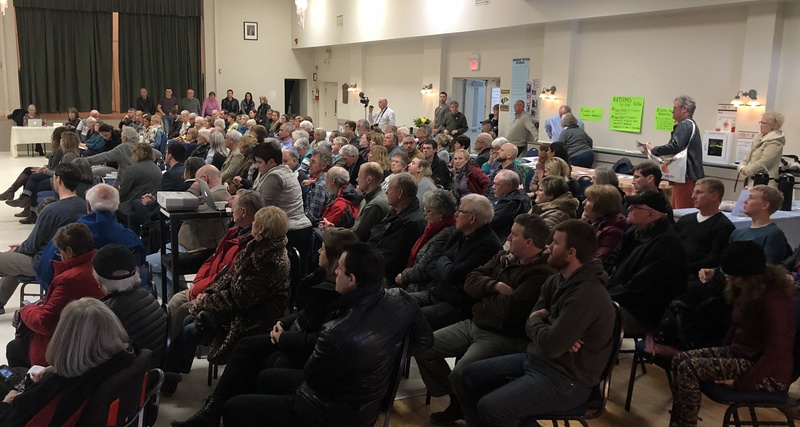 Among those in the audience were Simcoe County Warden Gerry Marshall and Tiny Township Mayor George Cornell, as well as Springwater Councillor Perry Ritchie. Stanton paid tribute to the courage of human rights workers who “are on the front lines of taking personal harm… to stand up for ordinary folks that just want a fighting chance to build their lives in their own country.” “The world needs more Karen Springs,” he said, to applause. “And Edwin Espinals as well,” he added, to more applause. 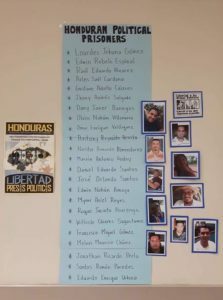 The November 26 2017 Honduran election has been widely recognized as having fraudulently robbed Opposition Alliance presidential candidate Salvador Nasralla of victory. Millions protested the seizing of power by Juan Orlando Hernandez, who ran for a second term despite being constitutionally ineligible. The protests resulted in more than 30 deaths that the UN High Commissioner for Human Rights has characterized as extra-judicial killings by security forces. Espinal was among 22 pro-democracy supporters arrested on trumped-up charges. Despite these clear abuses, the United States recognized the Hernandez government in December, and Canada followed suit a day later. Stanton urged those present to “stand with the Spring family, with Karen and Edwin and the other political prisoners in Honduras and do everything we can to put pressure on the Canadian government.” He said that Freeland does have “a listening ear” on the issue. However, Canada’s voice needs to be stronger, he said. Nuttall pointed to $37 million in aid that Canada provides to Honduras. “Why are we spending S37 million a year propping up a government that is hurting its own people?” He urged that Canada announce it will cut back until Honduras respects the rights of its citizens. “Follow the money,” echoed Springwater’s Bill French. In each case, as people were being arbitrarily arrested and being shot in the streets, “the surprising bit is that Canada throughout this process has taken the side of the Honduran military,” Shipley said. But perhaps, he said, it’s less surprising when one considers that a lot of Canadian capital is invested in Honduras, in the mining sector, in manufacturing, in the tourism industry. “Unfortunately the Canadian government decided it was more important to support those interests,” Shipley said, a stance that has held across political lines in Canada, involving decisions by both the Harper and Trudeau governments, but has been uniformly harmful to Hondurans. Questions from some in the audience indicated a level of understanding of Canada’s financial complicity. There was a request for a list of Canadian companies that invest in the country, and Karen Spring promised that would be posted on the Simcoe County Honduras Rights Monitor. Members of the audience were invited to sign letters to the Canadian government and a petition in Spanish. The Springs have appointments next week in Ottawa with Global Affairs Canada, and with Sofia Cerrato Rodriguez, the Honduran Ambassador to Canada, and plan to take the messages from the Elmvale meeting to those officials. Such great work and community support! Thank you so much to the community of Elmvale and your local politicians for their involvement in this critical human rights issue. This kind of presence inspires us all and helps keep us hopeful that our government will hold the Honduran state accountable for its crimes.